For the many years we’ve been in business, we have been striving to provide our clients the best quality service possible to gain their full satisfaction. And they’ve shown their appreciation by coming back to us repeatedly. We constantly improve our arena and keep our custom gaming PCs up to date for your best experience possible. We’ve developed a strong relationship with local businesses, making it easy for people to take part in our arenas based on their feedback. From helping people blow off some steam to making it easy to sample top-tier gaming and entertainment, we ensure that entertainment isn’t just a hope – it’s an expectation. Galaxy Gaming Is the Biggest Laser Combat & Computer Gaming Center in The Midwest! We don’t just offer a few simple services, though. We are an all-inclusive team who are always looking for easy ways to help people have some fun and find an extra spark and excitement along the way. We host birthday parties, bachelor parties, casual gaming and other private/public events to the highest possible standard. From youth groups activities and student activities to corporate team-building events and more, we are tailored for all kinds of groups. However, this isn’t just for parties. Individuals are welcome too! If you fancy competing with the many individuals who turn up for some competitive madness, we are more than happy to help make that possible for you. 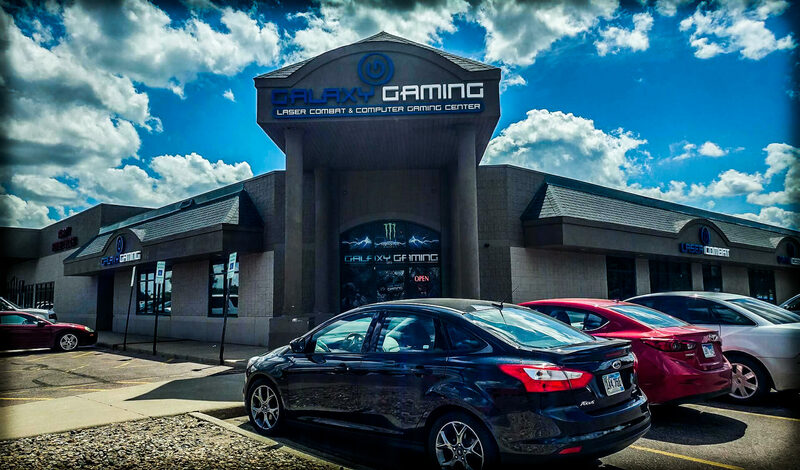 Galaxy Gaming was established back in 2005, starting life as just a LAN (Local Area Network) center. Thanks to the passionate commitment of our team and our desire to stay on track with technology, we’ve grown and expanded further than we ever expected. In 2011, we expanded and opened up an indoors laser combat arena. With the size of the arena at 5000 sq ft. we make sure everyone can enjoy themselves properly. Our computers can also be used for educational and training purposes. We also host games outdoors and can certainly host the party at your place for as long as you have enough obstacles. Whatever you need, the team will do all that they can to accommodate your needs to deliver the most exciting experience possible. Gift cards are now available and you can use them to purchase any item we offer in store for sale. From gaming time, laser tag sessions, energy drinks and even gaming computers, we make it easy for people to get what they need to take home the Galaxy Gaming experience with them. Need any more details? Then contact the team today and we’ll deliver all needed information.